The Nova Scotia Talent Trust (NSTT) was established in 1944 principally to assist the career of Truro born contralto, Portia White. Members of the Halifax Ladies Club and voice teacher Dr. Ernesto Vinci strongly recommended to the provincial government of the day that, based on her outstanding talent, financial assistance be provided to Ms. White to enable her to pursue a professional singing career. 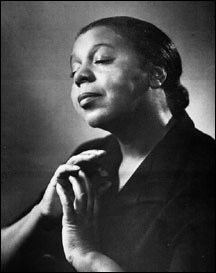 As a result of the support awarded by the Talent Trust, Ms. White undertook professional training in New York City and went on to an illustrious concert career. In 1949, we turned our attention to other gifted Nova Scotians. Since that time the we've assisted the professional development of over 1,000 Nova Scotians and have awarded scholarships totaling over two million dollars. The Nova Scotia Talent Trust was established through incorporation under the province's Companies Act (in the absence of a Societies Act in 1944). Although created as an autonomous organization, the NSTT's first directors included provincial and municipal government representatives and its initial source of funds was a grant from the Province of Nova Scotia. Since our incorporation the Province has played a vital role in the funding and the administration of the Talent Trust's activities. For many years the secretariat function was fulfilled by the Department of Education. In 1983, this responsibility was given to the Culture Division, then a part of the Department of Culture, Recreation & Fitness, Tourism, Culture and Heritage and now part of the Department of Communities, Culture and Heritage. Beginning in 1983, the Talent Trust board was chaired by the Deputy Minister (or their designate) for the Department responsible for Culture and its directors came from Nova Scotia's arts community. 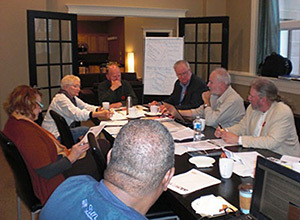 The board not only governed the NSTT's operations, but also reviewed applications to select scholarship recipients. In 1994, the Talent Trust was restructured to include the Board of Directors and a Scholarship Selection Committee. Since that time the Scholarship Selection Committee, which is comprised of professional Nova Scotian artists and arts educators, has reviewed applications and selected scholarship and special award recipients. The partnership between government and community allows the NSTT to direct nearly all of our financial resources to scholarships. In 2002, we named our first board chair from the community. Mr. Timothy Matthews was elected chair of the Board by the members at the Annual General Meeting in December. The decision had been made earlier in the year to discontinue the practice of having a government representative serve as chair. We wanted to strengthen the support we received from the community and having an individual from the community as chair better achieved this goal. The Talent Trust became fully independent in 2010 when we moved into a new office space in the Maritime Centre and in 2017 to our present location at 2307 Clifton Street. Over the last ten years the Talent Trust has been taking steps to increase our profile in the community. For example, we organized performances by young music scholarship recipients at Government House, and in 2003 produced a festival of artists, called "Tomorrow Today". In 2005, the Talent Trust 60+ Gala Concert featuring both current and past scholarship recipients in all artistic disciplines. In June 2011 scholarship recipients, NSTT supporters and Board members were invited to a reception at the Government House. Since 2011, an email newsletter informs supporters on a regular basis of upcoming events by scholarship recipients. In 2012, the Talent Trust was chosen by the 2011 Canada Games Legacy Fund Committee to hold in trust $200,000 to establish two awards in the amount of $10,000 each. The 2011 Canada Games Young Artist of Excellence Awards are given out annually since 2013. We are looking forward to celebrate our 75th Anniversary in 2019 by highlighting former and present scholarship recipients. Since 1944, the Talent Trust's scholarship recipients have come from a wide range of media within the disciplines of dance, music, circus arts, theatre, visual arts, literary arts, and media arts. Recipients have studied in a variety of settings including summer festivals and instructional programs, professional arts training institutions, university training programs, and private instruction. These programs take place in Canada, the United States, and Europe, in settings such as the National Ballet School of Canada, the National Theatre School of Canada, the Art Institute of Chicago, NSCAD Universite, the Royal Academy of Dramatic Arts, the New England Conservatory of Music, the McGill University Conservatory, and more.